A comprehensive guide for all your juicing needs. Fruit and vegetable juices, green smoothies, and probiotic drinks have taken America by storm. And it’s no wonder–these living, nutritious drinks help you lose weight and easily absorb essential nutrients, giving you energy and making you look and feel healthier! With The Big Book of Juicing, you’ll learn how to make a variety of healthy drinks, which fruits and vegetables provide the nutrients to meet your specific health needs, and which produce is better eaten whole than juiced or blended. You’ll discover how to choose the right juicer, what to avoid juicing, and tips for going on a juice detox. The full-color pictures and detailed instructions will inspire you to start blending straightaway. These recipes are easy, delicious, and take no more than two minutes to make. Incorporate juices and smoothies into your daily diet and feel the difference. In addition to juices, readers will learn how green smoothies are hands down one of the best supplements to any diet. With at least one smoothie a day your body will not only recive an extra boost of nutrients, but it will begin to crave these healthier foods naturally. Never has it been easier to reach fitness goals, drop that weight, and improve your immune system with these enriching smoothies. 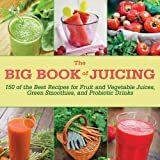 The Big Book of Juicing finishes on a high note by providing straightforward instructions on how to create probiotic drinks. The health benefits of these drinks are no secret, including positive effectives on digestion, metabolism, and the immune system, and now you can enjoy them at home. Enthusiasts of kombucha–a bubbly probiotic drink now sold regularly in grocery stores and local lunch spots–look to its high levels of B vitamins and amino acids, which are said to improve your mood, energy levels, joint function, and skin. Whether you’re new to juicing or already a stalwart supporter, you’ll find tips and recipes that the whole family will love!